One evening a month at different parishes around the city, parishioners from St. Vincent’s (typically Peggy Meyer, Mary Laukaitis, Louise Gregg, and myself, and including at various times Joe and Peggy Cronyn, Anne Maura English, Denny and Rita McMullin, Sue Woodman, Marie Rippey, and others) join about a hundred fellow participants in Bishop Madden’s Prayer Walks. The walk starts simply enough in a parish’s meeting hall: a personal welcome to each participant from Bishop Madden, along with a bowl of soup, a sandwich, a cookie and something to drink. After eating, the group assembles in the church for the first prayers. 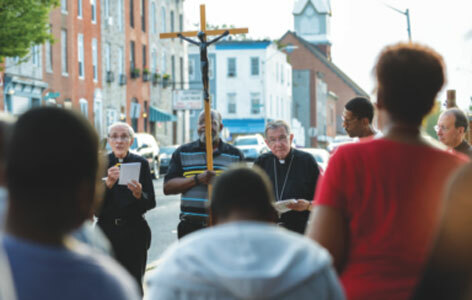 Our itinerary for one of these nights includes 3 or 4 locations around the parish that have witnessed terrible violence: robberies, shootings, rapes and murders. Led by a cross-bearer and Bishop Madden, we sing a hymn to pace our walking. The police facilitate our journey. We head for the first location, where we are told the story of that place: a place of tragedy where a twenty-year-old man was murdered. We hear his name; we hear of his family. Each of us is momentarily lost as we think about that horrible night. It is a powerful moment. These prayer walks take place throughout the year. Although the wind is cold in winter and the heat is intense in summer, there is something else that is much more important and much more distressing. We need to hear God’s word and we need to ask God’s help. And so, a Gospel passage is read, and together we recite a prayer. Then we sing and walk and hear again about other tragedies at the other locations, and again we pray. Finally, we return to the church for closing thoughts and prayers. The walk is not long; the evening is over by 7:30 PM. Bishop Madden always emphasizes that the importance of the walks is this: we are bearing witness to Christ, and bringing Christ to these places of tragedy. Perhaps we are bringing a sliver of hope as well. While we walk, we see house doors open. Residents look out to see us singing, walking and praying in their communities. We even pass out prayer cards to those who might want them. We invite other parishioners from St. Vincent’s to come along and join us. There is always plenty of room for additional participants. This entry was posted in Communications & Outreach. Bookmark the permalink.